“I was Made to Love You” masquerades as a comic relief episode until it punches us in the stomach with no less than two unhappy endings. In brief, Buffy’s recent obsession with her own loneliness after being dumped by Riley leads her to ask Doctor Ben out on a date. But she sees her own plight reflected in that of April, a beautiful, monomaniacal robot built to be the lover of– and then dumped by– mad college scientist Warren. April goes ballistic when she learns that Warren doesn’t love her anymore and finally powers down, never understanding what her purpose was if not to love her boyfriend. Buffy manages to scrape a lesson out of that somewhere, and probably forgets all about it because she comes home and finds her in-remission mom, Joyce, dead on the couch. Just like that. And then April dies. We don’t even know what happened to the robot body. Did Buffy hide it? Fold it up and stuff it into Giles’ trunk? There are plenty of opportunities for a female Data in the Scooby Gang, I’m thinking. 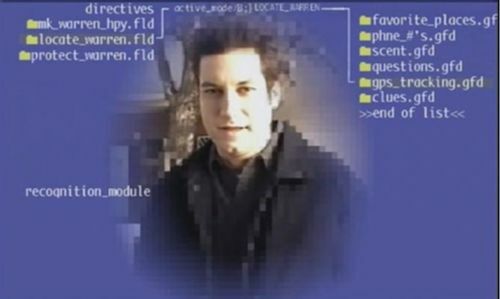 But if one were to reprogram April– and who could do this besides maybe Willow– what directives would replace April’s, which start with “be a good girlfriend” and end with “laugh at Warren’s jokes?” This robot has some sophisticated programming– note that she has a whole subroutine dedicated to recognizing Warren as a “snappy dresser.” (She has about four subroutines dedicated to “fetishes.”) Were you Willow, how would you reprogram her? “Help Buffy and her friends?” “Be a good person?” A good one for Warren to have added if it didn’t sap too many precious resources from “Neckrubs” would have been “The Relative Density of Human Flesh and Bone” and maybe “Crimes and Misdemeanors.” Heck, it’s sort of odd to me that Warren never told April his last name. So really the whole April mess is meant to reflect Buffy’s loneliness and wish for a good boyfriend to make her “whole,” and the end result of the story is she decides she chooses to “be with Buffy” for a while. I hate to be the one to bring it up, but personally I think Buffy’s correct to suggest she might fare better in relationships if she were a little less self-involved. Didn’t she more or less dump Riley, actually? Wasn’t she already getting rid of him before he left? But she really can’t not be self-involved, given that the world revolves around her. Still, admitting you have a problem is the first step to healing. (“I’m Buffy, and I’m the Lead.”) My recommendation? Therapy, not dating. Especially after the end of this episode. But the finest moment of the episode comes at around the middle, when Spike comes to the magic shop and is shunned by the whole Scooby Gang. (Buffy has declared him persona non grata, and he did tie her up in a mad attempt to get her to love him, the moron.) He tries to be friendly, but it’s Giles who changes the rules. 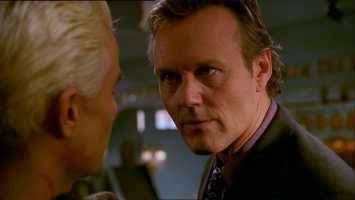 Giles finally talks to Spike as not a friend but as a demonic force that must be spoken to clearly, as one would a child. “We are not your way to Buffy,” Giles says. “There is no way to Buffy.” And he looks as though he just might kill Spike, and yet, does not, because so far this demon has been more or less an ally. But as of this moment, Giles makes it clear that Spike is no longer welcome to fancy himself different from what he is: an outsider with his own magical– presumably evil– destiny. Which brings us to the real clincher, a roughly six-second beat at the end of the episode that carries the biggest wallop of the whole season. Buffy comes home to find Joyce, who has just been doing well enough to go out on her first date, lying unconscious if not dead on the sofa. (By all incoming reports, including the previews of next episode, she’s dead.) It’s a completely unexpected development, whether it should have been or not, and it’s one none of us really want to think about very much. We’ll look fondly at Kristine Sutherland the loss of her character next week.